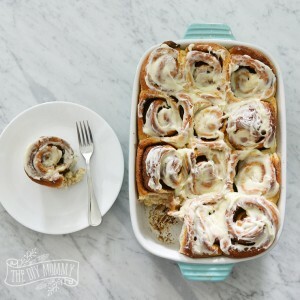 These cinnamon buns taste just like the ones you'd buy at Cinnabon. They're sweet, gooey, and so decadent! Dissolve the yeast in the warm milk and let stand for 5-10 minutes to "proof" (yeast will bubble and float to the top - this tells you that your buns will rise later!). Mix in eggs, margarine, sugar and salt. Mix in flour a cup at a time with a spoon, then by hand. Knead the dough for about 5 minutes until it forms a smooth, round ball. Place in a greased bowl, cover and let it sit in a warm place for an hour or two until it's almost doubled (I have a "proof" feature on my convection oven, so I just pop that on and place the dough inside to rise!). Roll the dough out to a 17" by 22" rectangle. In a small bow, mix the brown sugar & cinnamon together. Spread the softened butter on it, then sprinkle it with the brown sugar & cinnamon mixture, making sure it's spread evenly and reaches to all of the edges. Roll the dough up (starting on one long side) tightly, patting as you go. Cut it into 12 equal sized slices and place in a greased baking dish. Let them rise again until they are about doubled. Bake them at 400 degrees F for 15-20 minutes (I like to underbake them a little for the gooeyness factor). While they are baking, make the cream cheese icing by whipping together the cream cheese, butter, icing sugar, vanilla and salt. After the buns are out of the oven and cooled for 15 minutes, ice.